Sincere gratitude goes out to everyone who took time to perform a random act of kindness as part of our first “Catch A Smile” day. We received tons of messages and emails reporting good deeds and joy that was spread on October 23. Each and every one of you has inspired us greatly and we wanted to share some of the stories with you. Our next “Catch A Smile” day will be Tuesday, November 26. This date is very close to the USA Thanksgiving so we can start the spirit of giving early this year! The good deed of the month will be to PERFORM A RANDOM ACT OF KINDNESS FOR YOUR NEIGHBOR… whether it be your next door neighbor, someone in your neighborhood, someone who works at the store close to your home, same office building…. anyone “near by”. Sometimes we are physically very close to people yet mentally very distant. Let’s bring some happiness to our neighborhoods and place of work Please click “attending” (https://www.facebook.com/events/423899291049875/) and invite your friends to join in the “small acts with great love” movement! Together, we can help make this world a happier and more joyous place simple because its the right thing to do. 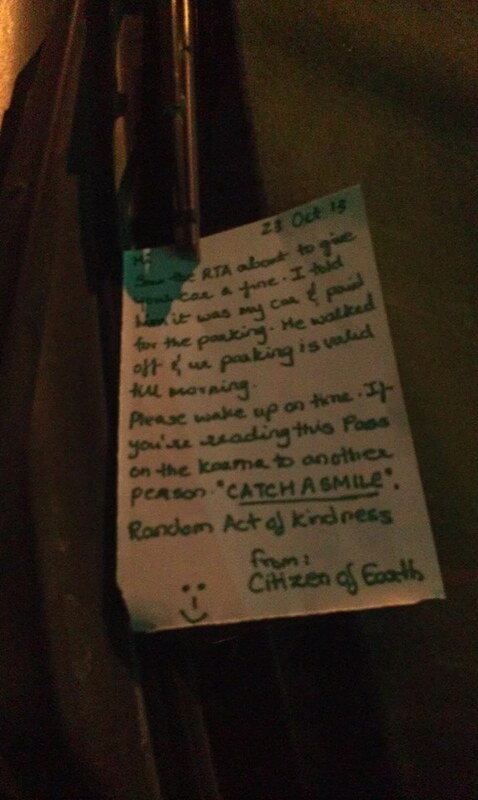 Just a few of the random acts of kindness performed…. I just added quarters to all the parking meters! No parking tickets today! I was driving pretty much all day on 23rd (up and down a couple of loooooooong motorways) and I stopped for a quick Costa at a service station. It struck me how a) YOUNG the serving team were and then b) how rammed and harrassed they looked too. Till roll running out, a never ending queue and complicated orders etc. The relief on her face was perfect. I could see the calmness take over her as she ‘relaxed’ a little with my order, lovingly preparing my latte. She thanked me and we parted ways. I hope that brief ‘ease up’ helped her day. Looking forward to next month…! Momma Patty helped one of her clients whose husband is very ill. Their washing machine was broken down and she took their clothes home and did the washing and drying. I had a very busy day as I was in the middle of my move from house to house. We went to the mall for take-out and I bought a candy rose and gave it to a lady sitting on a bench. She looked at me like I was mad but I just smiled and walked on. Later, when I was finished my groceries I saw her sitting there still looking at it in astonishment, trying to understand how come it landed up in her hands. What a joy to participate in the Catch A Smile campaign. A group of 14 diners *(plus myself)* met for dinner this evening… I had asked the manager to simply let everyone in our party believe they were getting their own checks, but to have the total tallied and I would cover the gathering. Funny, while they had gone out for a smoke I wrapped up the bill, and when the group returned to our table they stood around chatting for the longest time. Finally, one of the group asked our waiter to please bring their checks so they could leave. I loved the look on their faces when the waiter announced that their bills had been paid in full. Joy, joy, joy! Love, love, love! Thank you for initiating the opportunity to bless others, Mina Liccione. Love and admire you!!! Surprised our receptionist with a banana cake that says thanks for dealing with us! Saw this RTA inspector about to give a car a fine, quickly ran over and said it was my car and told him “I am gonna pay for it.” He smiled and walked away & I paid for the parking. LOL hope the car owner wakes up on time in the morning! I left him a note telling him about Catch A Smile and that he should join us! This morning I sent a flower bouquet with a nice note to an old woman who lives in our building. Today I bought a homeless man lunch and he enjoyed it! Today I was teaching at AUS so I had to plan my random acts of kindness around campus. A student inspired the first act- leaving dirhams on a few different vending machines in the Arts & Science buildings with post-its saying “have a snack on us!” or “free water! take a dirham and enjoy” LOL! The second act was geared towards a specific group of employees who work at the Dunkin’ Donuts on campus. I don’t know them but I see them every now and then when I enter the student center. Every time I have seen them there is a lonnnng line and they are working hard to move fast and get the orders right all with a smile. Today, I thought it would be nice to gift them some sweets & a container of chocolates and let them know they are appreciated. They were pretty surprised at first but then very happy. My sister and I cooked lots of food for the homeless men on the main street. We brought trays of food with plates for them to have. I was watching the #Milan_Barca match and having some sheesha with the guys. So what I did was I paid for the table next to us, and asked the cashier to call me later and tell me about their reaction. He just did a while ago, and – according to him – they were surprised and insisted to know who did it and why, because – according to them – it is not something that happens every day. But they were happy about it . I told my friends about this event, and they’ll all try to do something. I was inspired by this today! We went to a pumpkin patch that just opened today. There was another group of people there that wanted to go into the corn maze ($5 each) but nobody had cash and the onsite ATM didn’t work yet. The place was not equipped yet to take credit/ debit cards yet either. Anyway, the group was preparing to leave so i paid for them to do the corn maze. They were completely surprised and grateful. Unfortunately, I didn’t think to tell them about this event! I wish that I had. Next time! MY random act of kindness took place ont he train. This lady was standing up and I just got up and let her sit down. The lady looked confused and rather shocked and then was like : Thank you….! and I just smiled at her. It feels good to do things like this. We should do it every day rather than just one. This entry was posted in Uncategorized and tagged catch a smile, Clowns Who Care, dubai, Dubomedy, happiness, heal the world, joy, Mina Liccione, random acts of kindness by clownswhocare. Bookmark the permalink.